11 Wickets: Fantasy games have become one of the most trending subjects in a “Sports loving” country like India and 11 wickets is one of the latest entries in the same forte. 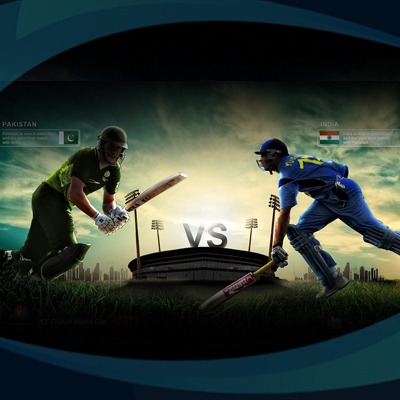 The site is all about providing a platform to all the cricket lovers in India who would like to earn some real cash by trying their luck and cricket knowledge whilst playing the games and contest available on the website. Apart from cricket, the site offers various games and contest for the Football fans as well and they can create teams, join the contest and earn cash prizes as per their skill level and performance at a particular game. 11 wickets was created and designs to enable numerous sports lovers around the country with an opportunity to win some real cash prizes out of their knowledge and skills in regards to cricket and football sports. As per the information available on the website, the motive behind the creation of the same has said to be a platform for the Indian sports lovers to try their luck and skills to win real cash and also to become the leading sports fantasy platform in the country. 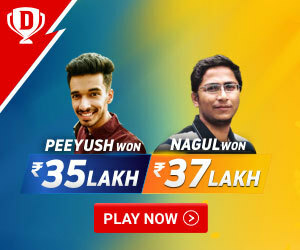 11 wickets.com was founded in the year 2018 and currently been owned and operated by Ability games, which is a gaming platform unit of Stuti hardware Pvt Ltd. For the past few months when Indian sports fans have attracted towards fantasy games forte with great interest, 11 wickets has emerged out as one of the fastest growing sports fantasy websites in the country. The website is currently endorsed by famous Bollywood Diva Sunny Leone and aimed towards becoming one of the most sought after sports gaming website in the coming times. 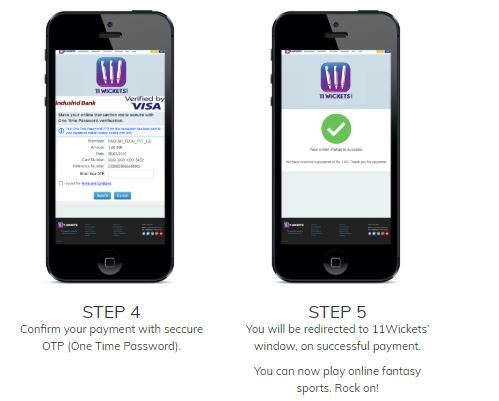 Once you login onto the 11 wickets.com, you will get along with a Sports fantasy gaming website with a big layout and numerous options available within the first view. Within the homepage you would be getting an option to sign in to the website via your Facebook and Google account and other tabs available in order to check out the list of all the upcoming matches, matches that you have joined being a member, information about the points system, option to refer a friend, offers available and FAQs regarding any game or contest. Here you would be getting a list of the number of matches getting played in the coming days along with a ticking timer telling you about the time left for joining a contest. There will be two tabs of “Cricket “ and Football” featuring all the matches form the domestic and the International arena from around the world. Dates and timings of the matches are mentioned there only along with an option to “ enter the lobby” which you would only be able to access once getting signed up to the website. Also Check: What is Dream 11 Fantasy Cricket & How can one Earn Money from Dream11. This will tell you about the matches you have joined in regards to the available cash contests and games on the website. You will only be able to access it after getting enrolled and joining cash or free contest in regards to a particular match in cricket or football. Here you will be getting the results of the matches you have joined being a member along with the information about any cash or free contest you have won or lost in the process. Again, you have to be enrolled via Facebook or Google account to get access to the gaming contest available here. In this tab, you will get to know about the points system brought in use by the website during the course of various footballs and cricket matches around. 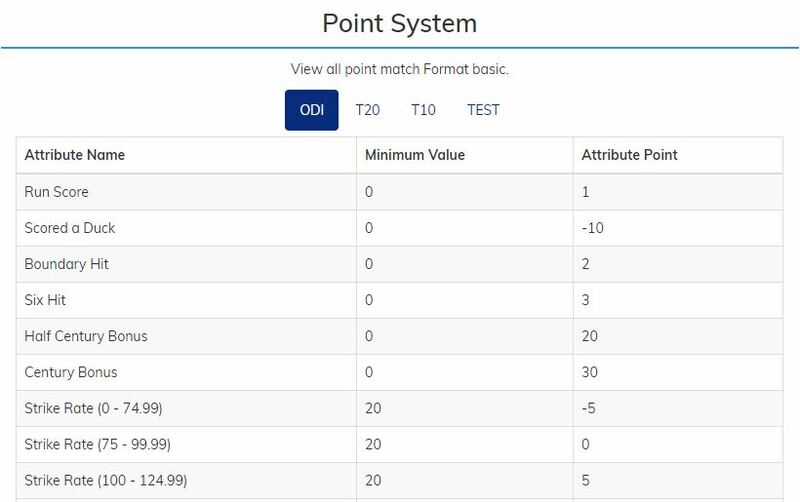 The point format is been segregated into three categories namely T10, T20, ODI and Test matches for Cricket whilst following different system for the Football fantasy games as well. This option is available for the current users and once you get enrolled to the website, you can then get a referral bonus of 10rs per referral and you can do this whilst sharing the referral link and referral code with your friend to make them get started with the games available on the website. It’s also been stated that the referrer would be eligible for the bonus up to 180 days of his enrollment to the website and the 11 wickets website management holds the right to amend or withdraw the scheme anytime in the process. Before you start playing any match, you must understand the overall concept of playing. Whilst you get started, you will get to see a pool of players with the available 100 credits in your kitty. You are now required to pick the given players according to the credit amount associated to their name with the available credit limit and once you are done with the selection of 11 players in the team, you are now ready to go. 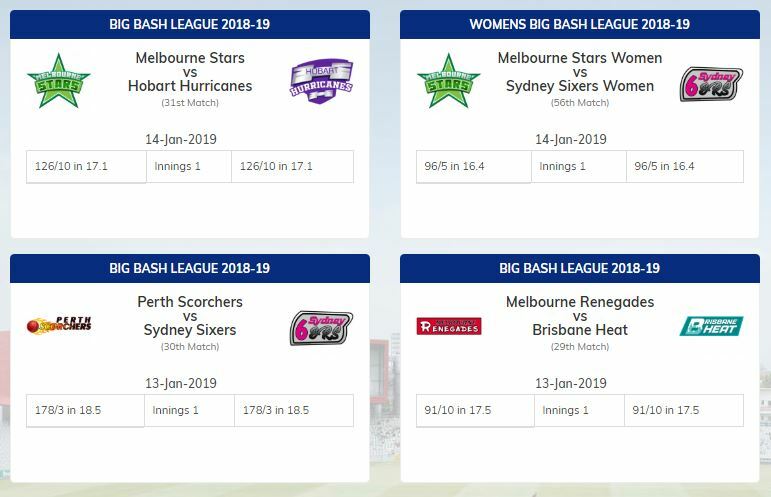 Once the user is signed onto the website he or she can start playing a contest by first picking a match in the cricket category from the available list of ongoing matches or upcoming fixtures. You are then required to pick the required 11 players in accordance with the available 100 credits in the following format. Once you have been through with the given formats of team combination, you can now pick your team in any of the above-given combinations where you must be having a list of batsman, all rounder’s, wicketkeeper and bowlers in your team. As the performance of the player would make you win eventually, you must check the player’s profile and his past records by clicking on his name and picture. Other things which you must be taking care of in the process are the “available credits”, players selected and the deadline for the contest to be joined. Once you are done with your team selection, you must now choose the captain and the vice-captain of the team. You must be utmost careful whilst doing this as the captain would be giving you 2x points he or she will get out of his performance in the match. On the other hand, the vice-captain would be giving you 1.5x points in the same context. It’s not like that you can play with one team only as you have an option to enter into any multiple team contest with 6 teams in total. You can create a new team by clicking on the “CREATE TEAM” tab. You can make multiple changes to your team for any given game at any given time until the deadline by using the “edit team” button. One of the main things you must keep in mind is that all your players must be playing in the match and the team selection must be in accordance with the playing conditions and their past performances. -You are then required to enter your user name and mobile no. 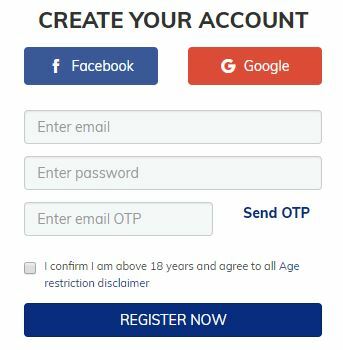 and once you enter the given otp on your mobile, you are all set to go. 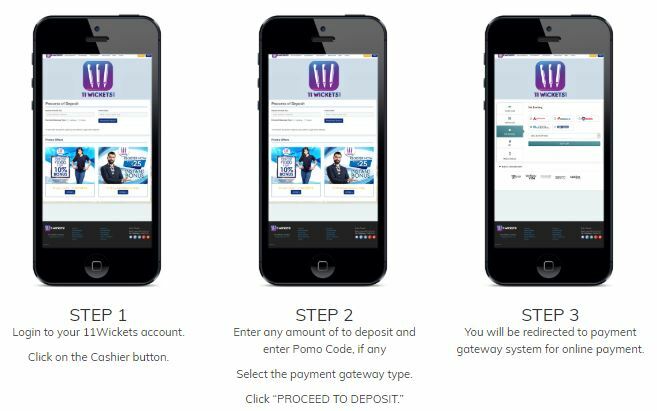 Once you are enrolled onto the 11 wickets website through their official website or mobile app, you can then click on the cashier button, enter the amount and then select the payment mode which could be either credit card, debit card, net banking or through E-wallets like Paytm, Phonepe and so on. Follow the given instructions and you are ready to go. 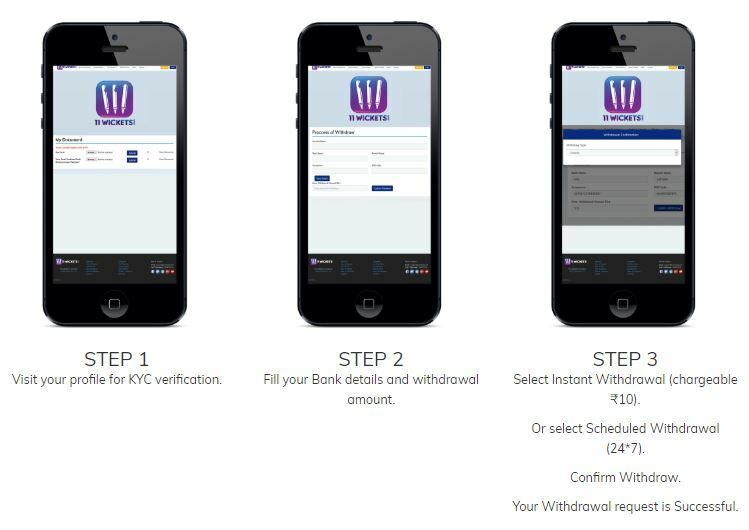 To withdraw the amount from your 11 wickets account, you have to go through the profile verification process which would include the verification of your personal and financial details. Once the verification is done, you can then withdraw the amount by filling in your bank details and click on the Withdraw tab. Moreover, you can pick from the “Instant approval “ or “ Schedule withdrawal” option and whilst you confirm the same, the amount will be there in your bank account. Apart from the regular games and contests, there are various promo offers introduced by the website in the past few months. To get the cash back you must enroll into any of the cash contest whilst using the Amazon pay E-wallet and then you will be eligible to get a cashback of 50% up to Rs 125. The Mobile number of the user must be verified first in order to enable the user for cash back and once eligible, he or she will get the cash back within the 72 hours of the transaction. Moreover, the offer is valid until 31st January 2019 once every month per user. 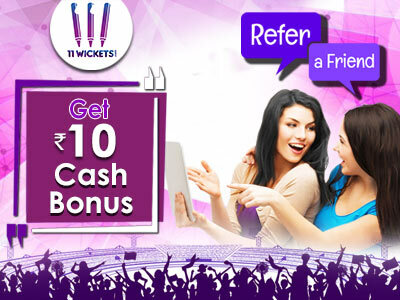 This offer is available for all the existing and new users and all they have to do is enrolling to the 11 wickets through the website or the mobile app and then refer one of their friends to join into the 11 wickets through their referral code or link shared. Upon enrollment, the user is eligible for a 10 Rs cash bonus. Moreover, the user is eligible for the offer up to 180 days from his enrollment and the received cash bonus would be automatically credited to your account. Also, the user itself is eligible for an instant 25 Rs bonus upon enrolling into the 11 wickets. By using this promo offer, a user can avail flat 10% cash back for their cash deposits of amounting 100rs to 5000 rs. All they have to do is use the code “11 WICKETS” whilst making the deposits and they will then be eligible for a 10% cash bonus which will be deposited within 72 hours of the deposit made. Moreover, the cashback will expire after the 180 days period and need to be sued within the same period. The offer cannot be included or clubbed with any other promotional scheme and cannot be withdrawn or transferred in the process. This offer is available for all the existing users of the 11 wickets and all they have to do is refer at least 1000 friends to make them join 11 wickets.Once they do the same they will be included in the list of player to do so and the player on the top of the leader board is then eligible to win a bike or 50000rs cash as a prize. You can use the referral code available in your personal profile or share the referral link with your friends via WhatsApp, message or social media modes around. The offer is available till 31s January and available for all the users with a minimum referral limit of 1000 users. This offer is available to all the existing users of the 11 wickets and all they have to do is enroll into any cash contest ranging from Rs 5 to Rs 5000 between Dec 1 and Dec 31st, 2018. All you need to ensure is that you have enrolled in various cash contest which adds up to Rs 10000 within a month and you will then be eligible for a chance to win Rs 10000 bonus amount. Once again the offer cannot be clubbed or combined with any other available offer or scheme on the website. The fantasy sports website has come up with a new offer of ‘meet and greet with Sunny Leone” whilst playing your favorite cash contest and games on 11 wickets. All you have to do is keep playing and keep joining the contest on the website and the top players from the leader board with maximum plays would be getting an opportunity to meet their favorite star Sunny Leone. 11 wickets comes along with a fair play policy in order to enable its users to play the games in the right spirit. It has laid down some guidelines in accordance with various options available on its website in regards to play different games whilst using the add on services like the customer support and feedback section. The users are provided with a chat option in order to get the required answers for their queries and complaints in regards to various games and contest on the website. Still, they are provided with some guidelines whilst using the same feature. Any behavior like begging, offending or making objectionable remarks to the customer support team is also not allowed and may result in the suspension of the user’s account. Any type of fraudulent activity is strictly not allowed during the course of the game and the discovery of the same would result in the suspension of the user’s account. The user is not allowed to reveal their personal details like email id, postal address or any other information during the chat sessions and any sort of racist comments during the chat is also forbidden. Although people would love to lay fantasy games around, they are still concerned about the security of their payments whilst enrolling to such contest online. Moreover, when we talk about 11 wickets, it comes with certain add on features to secure every penny that you have deposited into your account at 11 wickets. Their security system comes with a 128- bit SSL and their entire cash contest and games are scanned for any unethical modes of play by any of the users during the course of the game. Their security system raises an alarm if anything like that is been found out and this can certainly be quoted as an ‘add on “feature on this website. What’s good at 11 wickets? 11 wickets comes with some great fantasy gaming options for its users and its dashboard is equipped with loads of advanced features and enhanced user interface. Moreover, the details of every contest are clearly defined along with various aspects attached to it. You can simply enroll to the 11 wickets throu8gh the options provided at their home page and this comes as a”user-friendly’ option altogether. Moreover, one of the highlights of this website is their “Chat option” feature which is kind of new in the fantasy sports arena. 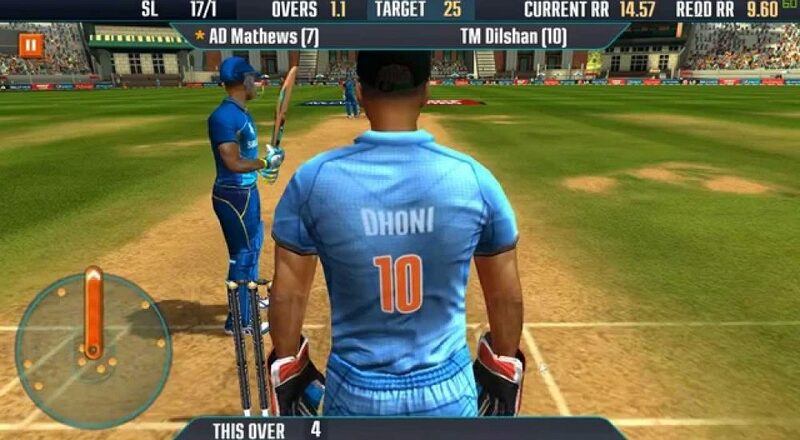 The user can chat with each other whilst playing a particular contest and they can also get the required assistance from the customer support team of the 11 wickets. Moreover, the security aspect is quite amazing on the website which straightaway identified any type of foul activity or fraudulent act during the course of the game. What’s “not so good” in 11 wickets? Although there aren’t any big glitches in its user interface and website layout, the website could have made it better for its users in terms of referral bonus and joining bonus for its new users. Whilst other fantasy games website are offering cash bonus of up to Rs 100, you will only get a joining bonus of Rs 25 along with a joining bonus of just Rs 10. The customer support system at 11 wickets is quite good and the user is getting a ‘Chat” option in order to get in touch with the customer service team of 11 wickets. There you can put in your feedback, queries or complaints in regards to any of the games or contest around the website. The feature is quite easy and simple to use for any of the new users as well. 11 wickets is quite a new and unique concept in the Fantasy sports arena and it has come up with some of the latest features and gaming option for its users in the past few months. Moreover, user can easily enroll, play and check out any of the given options without any glitch. With that been said, we would like to give it a big “Thumbs up” from our end!